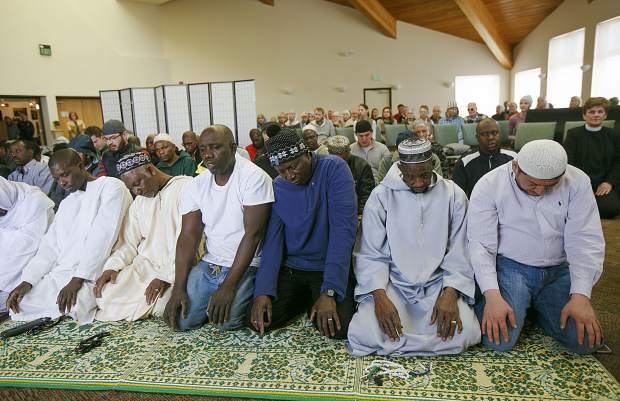 The local Muslim community holds a prayer for the New Zealand mosque shooting victims during the event held by the Summit Colorado Interfaith Council Friday, March 22, at the Lord of the Mountains Church in Dillon. On March 15, a hate-filled terror attack targeted two mosques in the New Zealand city of Christchurch that killed at least 50 people and wounded at least 50 others. 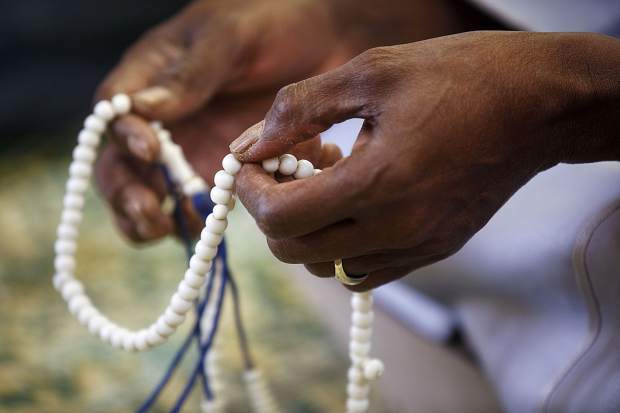 A misbaha, prayer beads, is held during the prayer for the New Zealand mosque shooting victims, during the event hosted by the Summit Colorado Interfaith Council Friday, March 22, at the Lord of the Mountains Church in Dillon. On March 15, a hate-filled terror attack targeted two mosques in the New Zealand city of Christchurch that killed at least 50 people and wounded at least 50 others. 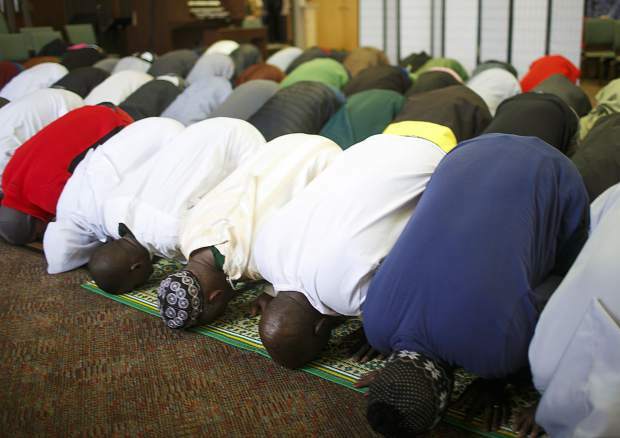 Local Muslim community members bow during a prayer for the New Zealand mosque shooting victims during the event held by the Summit Colorado Interfaith Council Friday, March 22, at the Lord of the Mountains Church in Dillon. On March 15, a hate-filled terror attack targeted two mosques in the New Zealand city of Christchurch that killed at least 50 people and wounded at least 50 others. 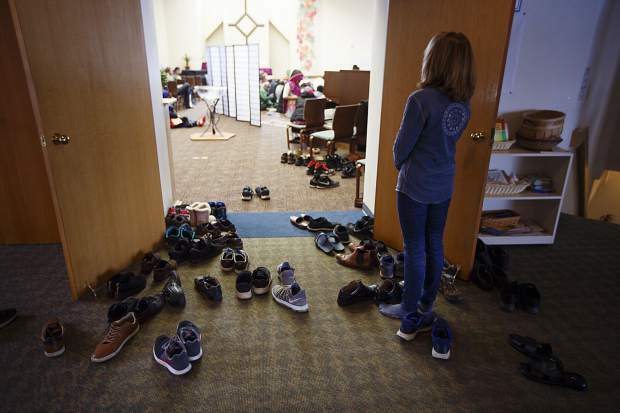 Shoes were placed outside the room during the prayer event for the New Zealand mosque shooting victims held by the Summit Colorado Interfaith Council Friday, March 22, at the Lord of the Mountains Church in Dillon. 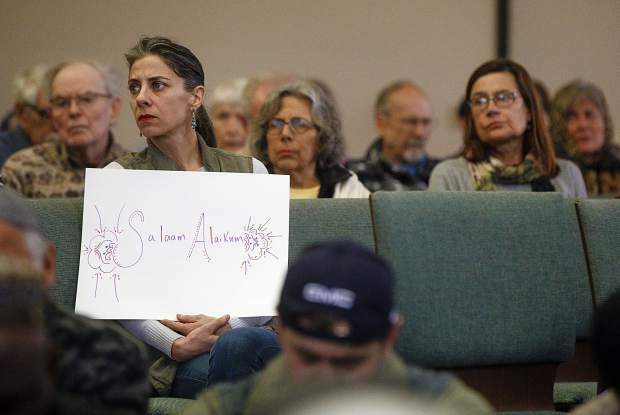 Raychel Kelly holds the "Salaam-Alaikum" sign, the Arabic greeting meaning "peace be unto you," during the event held by the Summit Colorado Interfaith Council Friday, March 22, at the Lord of the Mountains Church in Dillon. 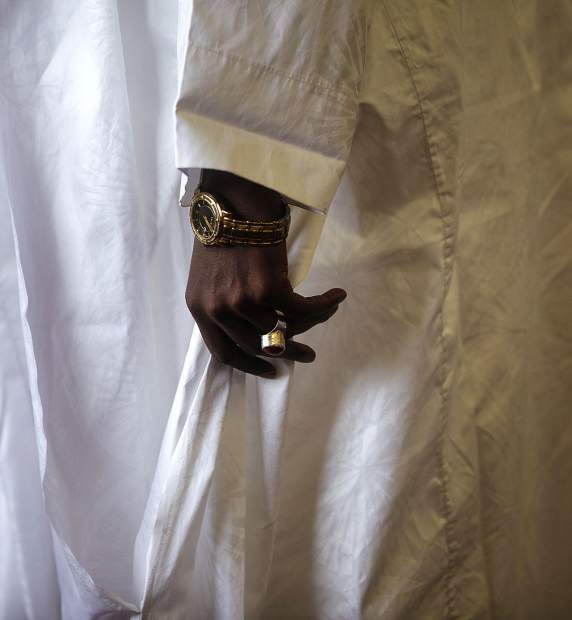 Saidoa Ly covers his face in a prayer for the New Zealand mosque shooting victims during the event held by the Summit Colorado Interfaith Council Friday, March 22, at the Lord of the Mountains Church in Dillon. On March 15, a hate-filled terror attack targeted two mosques in the New Zealand city of Christchurch that killed at least 50 people and wounded at least 50 others. 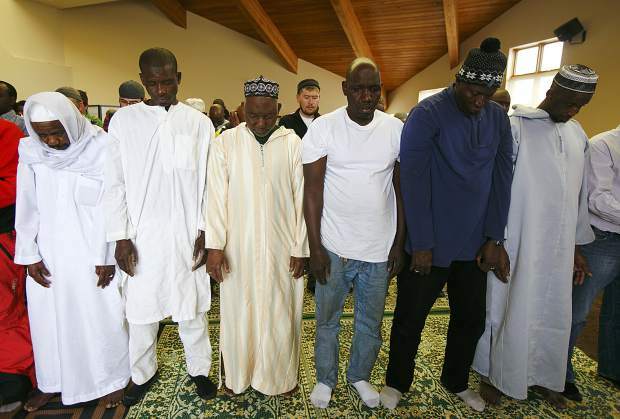 Tidiane Ndiaye, in front, and the Muslim community pray for the New Zealand mosque shooting victims during the event held by the Summit Colorado Interfaith Council Friday, March 22, at the Lord of the Mountains Church in Dillon. On March 15, a hate-filled terror attack targeted two mosques in the New Zealand city of Christchurch that killed at least 50 people and wounded at least 50 others. 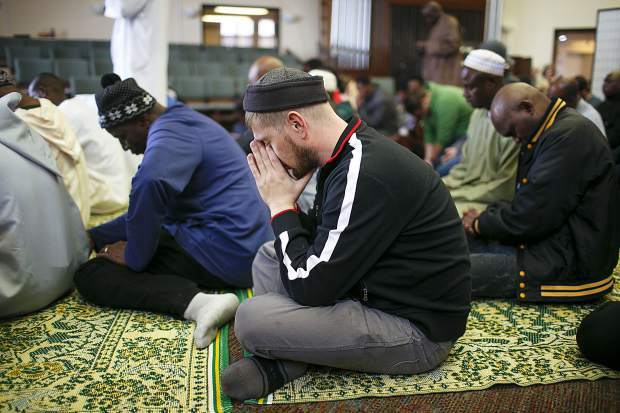 Summit County residents show support for the local Muslim community ahead of the prayer for the New Zealand mosque shooting victims, during the event held by the Summit Colorado Interfaith Council Friday, March 22, at the Lord of the Mountains Church in Dillon. 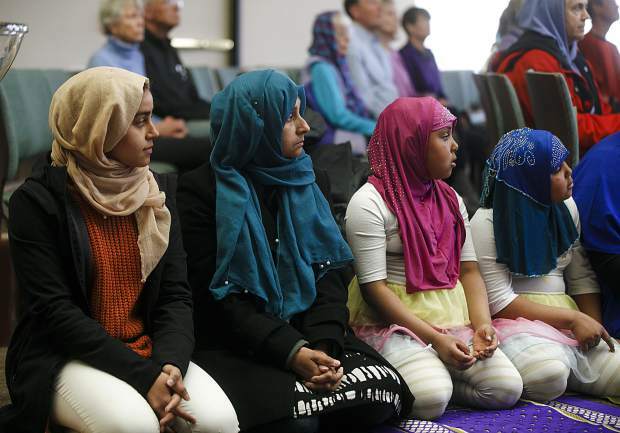 Local Muslim community members during a prayer for the New Zealand mosque shooting victims during the event held by the Summit Colorado Interfaith Council Friday, March 22, at the Lord of the Mountains Church in Dillon. On March 15, a hate-filled terror attack targeting two mosques in the New Zealand city of Christchurch killed at least 50 people and wounded at least 50 others. 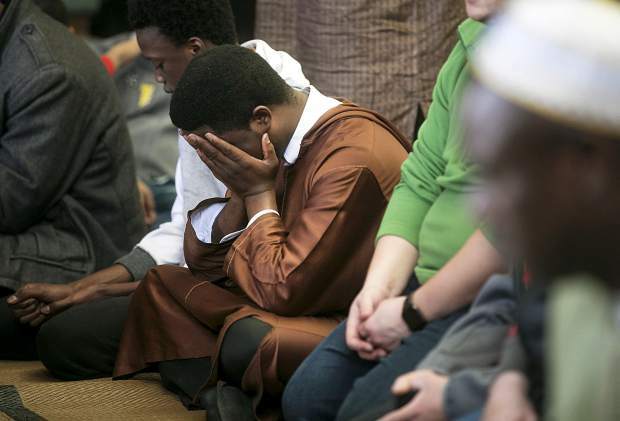 Mamadou Tidiane leads a prayer for the New Zealand mosque shooting victims during the event held by the Summit Colorado Interfaith Council Friday, March 22, at the Lord of the Mountains Church in Dillon. On March 15, a hate-filled terror attack targeting two mosques in the New Zealand city of Christchurch killed at least 50 people and wounded at least 50 others. Local Muslim community members bow during a prayer for the New Zealand mosque shooting victims during the event held by the Summit Colorado Interfaith Council Friday, March 22, at the Lord of the Mountains Church in Dillon. On March 15, a hate-filled terror attack targeting two mosques in the New Zealand city of Christchurch killed at least 50 people and wounded at least 50 others. 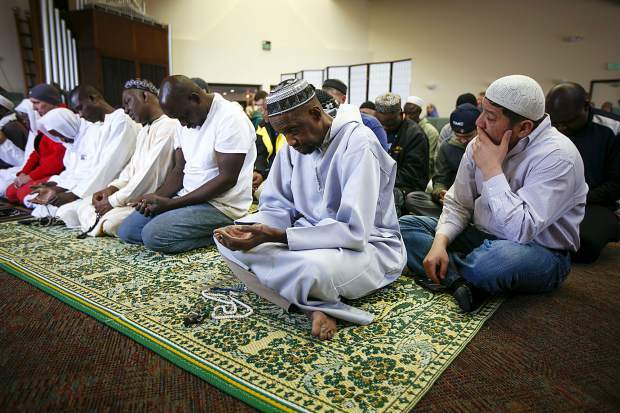 On Friday morning, thousands of individuals gathered around the Al Noor Mosque in Christchurch, New Zealand, taking in the Muslim call to prayer and observing a moment of silence as the crowd mourned the 50 people who lost their lives in a pair of terrorist attacks on mosques in the city last week. 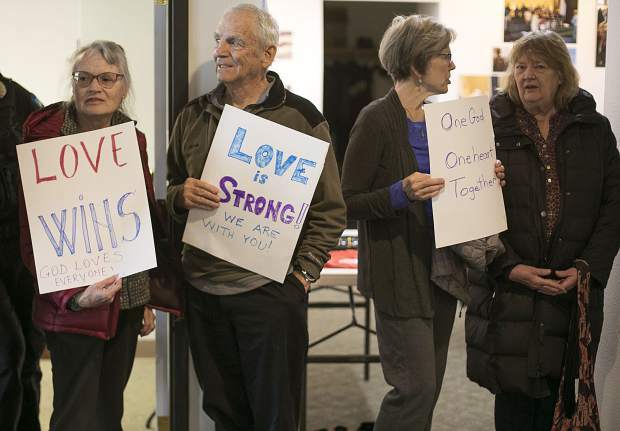 Hours later, more than 7,000 miles away, dozens of Summit County residents joined together inside the Lord of the Mountains Lutheran Church in Dillon to stand in solidarity with the county’s Muslim community as they came to worship. Though the attacks were half a world away, the reverberations were undoubtedly felt right here at home. Afterward, several participants followed the worshipers into the sanctuary and took part in the service. In addition to the Arabic sermon delivered by Imam Mamadou Tidiane to the group, Pastor Liliana Stahlberg delivered some words of unity to the mixed-faith congregation. 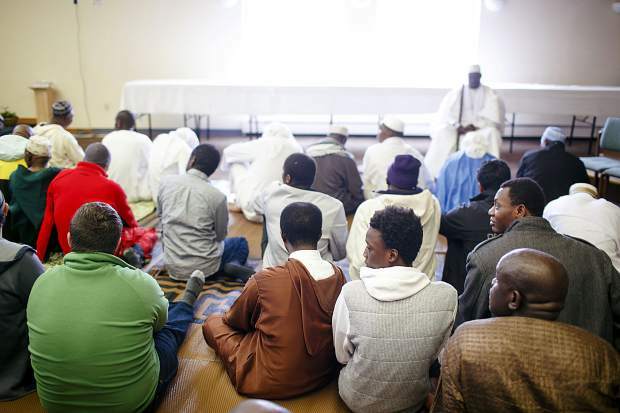 For the larger Muslim community in Summit and those making their way to the church on Friday — more than 50 in total from a diversity of backgrounds, and representing a number of nationalities across West Africa, Europe, the United States and more — the show of support was appreciated. 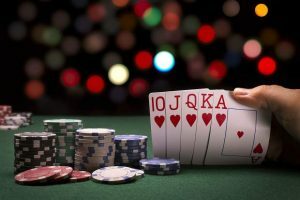 Unfortunately, this isn’t the first time that the Interfaith Council has felt the need to hold an event in support of a community following a major tragedy. The group also hosted similar events following the Sutherland Springs church shooting in Texas that killed 26 in 2017, and following the Pittsburgh synagogue shooting that killed 11 last year. For some community members, the simple gesture of arriving to show support following attacks like those in New Zealand is incredibly important. 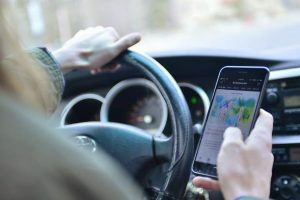 As global responses to these types of attacks become more common, some are hoping that the gatherings will not only help to show solidarity with victimized groups, but also help to create a better understanding between the different cultures and religions.